After The Tribune filed a complaint with Indiana’s public access counselor, a School City of Mishawaka official said the district will now comply with a legal requirement to provide the media with certain public records before school board meetings. At Superintendent Terry Barker’s direction, Mishawaka schools has consistently declined to provide The Tribune with what’s known as the “personnel report” prior to school board meetings. The document lists employee hirings, resignations and leaves of absences, among other things, that the board is asked to vote upon. The Tribune previously requested that Barker cite the legal code that supported his refusal to provide the report and his requirement that The Tribune say why it wanted the records. Barker didn’t offer legal support for his position. Joseph Hoage, Indiana’s public access counselor, issued an opinion stating Mishawaka schools violated the Access to Public Records Act by refusing to cite a specific exemption authorizing the withholding of the record and by requiring a reason for requesting the record. When contacted Thursday, Barker said he wasn’t trying to be difficult by previously denying The Tribune’s regular requests for the document; he simply thought it was an exception to the records that are legally required to be released. Two in three Iowans polled favor the creation of a board in state government to handle citizen complaints about violations of open meetings and access to government documents. The findings come as Gov. Terry Branstad has joined open government advocates in pushing the Legislature to create such a board, staffed by a full-time attorney, to handle complaints. The September poll, commissioned by the Iowa Freedom of Information Council, found Iowans want greater accountability and openness in government than is currently practiced, even though few Iowans know the specifics of the state’s open meetings and records laws. “In every question about the tension between openness and privacy, Iowans endorse more openness,” notes pollster J. Ann Selzer, president of Selzer & Co., in a summary of results. The poll — one of the first of its kind in the country — provides a baseline of Iowans’ beliefs that can be used by the Legislature, as well as by the Freedom of Information Council, Kathleen Richardson, the nonprofit organization’s executive secretary, said. The Hartford Courant could have slugged this editorial simply as NOOOOOOO! Gov. Dannel P. Malloy wants to fold the FOI Commission into a new super-watchdog agency. Consolidations do save money, and The Courant has endorsed the merger of the state’s economic development agencies. But the watchdogs should be kept separate — especially the FOI Commission, which defends citizens’ interest in seeing details on how government works. The governor would merge the FOI Commission, the state Elections Enforcement Commission, the Office of State Ethics, the Judicial Review Council and the Contracting Standards Board into an Office of Governmental Accountability. None of these watchdog agencies should be exempt from cost-cutting. Perhaps they could share office space and copying machines. But their staffs should be independent. Most of all, the Freedom of Information Commission should be on its own. It serves as a check on all of government, including the other watchdogs. The merger could create conflicts of interest. What if, for example, the new head of this super-watchdog agency (who might be appointed by the governor) is the subject of an FOI request? What if the governor who appointed him or her is FOIed? The FOI Commission is all about openness. The other watchdog agencies, however, must sometimes be sensitive to privacy matters. Judicial Review, for example, is respectful of judges’ confidential discussions on individual cases. This is a bad match with FOI. That is a massive understatement. The state’s FOI Commission is a national model for independence and efficiency, and to consolidate within other watchdogs will create an endless conflict of interest. Do As I Say…Not As I Do! Lawmakers are considering creation of a new board to better enforce Iowa’s open records and meetings laws, but there’s a notable exemption from the board’s oversight: the governor and his office. The board’s oversight also would not extend to operations of the legislative and judicial branches, reflecting current open records and meetings laws. But it’s the governor’s exemption that is raising eyebrows. 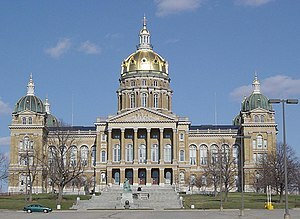 The seven-member Iowa Public Information Board created by Senate File 430 would cost taxpayers $155,000 a year, starting in the fiscal year that begins July 1, 2012, according to estimates from the nonpartisan Legislative Services Agency. Most of those costs are associated with salaries for an attorney and an administrative assistant. “That’s what we’re doing here, is we’re cutting education and growing state government,” said Iowa Association of School Boards attorney Mary Gannon. No, that’s not even close to what you’re doing here, and you bloody well know it. What Iowa is quite wisely thinking about doing is investing a modicum in seeing that all citizens in the state have some basic rights of access to information, and more importantly, some recourse when they are met with a stonewalling attempt by, well, just to pick a random example…a school board. The Senate passed the bill without any no votes earlier this month. The House State Government Committee approved the bill Wednesday, meaning it met a legislative deadline this week and remains alive for further consideration. This is smart legislation, a bill that really would make a huge difference in Iowa.